Junior and Coltsarrow-rightCreated with Sketch. Well what a really great morning of rugby. All the boys got all the game time that they wanted against 2 sides who were very worthy adversaries. First and foremost i am pleased to say Archie, the Minchinhampton Player who went off to hospital during the final game, was discharged quickly, and will be fine. His Dad, and the Minchinhampton coaches, were really pleased and grateful for the help of Ruth Reuben and Ali Hellewell assessing him and helping before the Ambulance came. 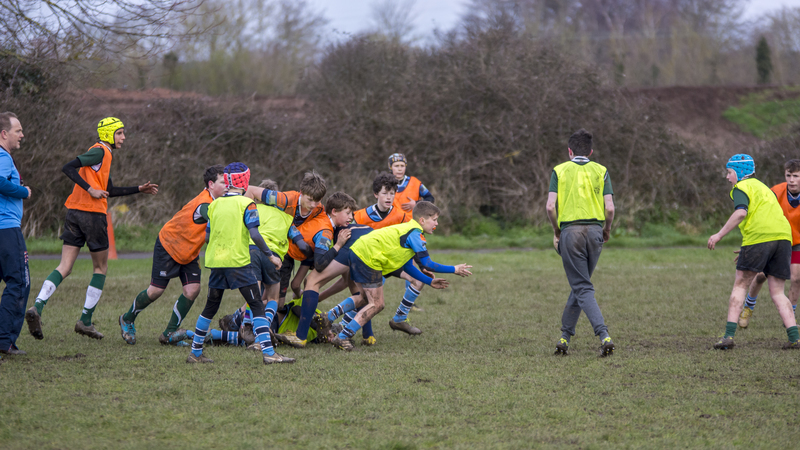 In the second match against Minchinhampton we gave the balance of the squad the full game which ended up being 45 minutes of a very high standard of rugby from both sides. Minchinhampton got to the LR Cup Final in Gloucester like us, so are a very good side and great opposition for us to play. It certainly was the best team performance I have seen for a long time. The game was almost error free, with both sides playing with a great deal of commitment, skill, and accuracy. Again, I think our defence was outstanding, with our forwards meeting onrushing ball carriers on the gain line, and our backs blitz defence causing real problem for Minchinhampton, led by Zeb. I think all the players in the squad who participated played to a very high level and some had their best games in a Topsham shirt. William Olney was simply irrepressible. Leading by example from the kick off to set the tone for the match, right up to the very end. He tackled low and then drove opposition players backwards, ran hard yards at the arms not shoulders of the opposition players and was very competitive at the breakdown. A Man of the Match Performance from him measured against several outstanding performances from the boys. I would like to name everyone but must mention in particular Henry 'Kyle Sinclair' Sims running great lines, Freddie as brave as ever in defence, and our formidable centre partnership Salty 'Manu ' Saltmarsh and Harrison 'Teo' Fox. The final score line was a win for Topsham 24:7. A really good morning of rugby from all of the boys that bodes well for the rest of the season. We have another good match up on Sunday against Newton Abbott who got to the Devon Festival Final last season, so I look forward to another good game for the U14s. Thank you to Salty, Ollie, George, and Peter O'Mahony (William O) for cleaning the changing rooms. Watch out the rest of you - we need to clean up after ourselves after every game now boys!